The UN-backed talks between the Government of the DRC and the mainly Tutsi group known as the National Congress in Defense of the People (CNDP) began in Nairobi last month in a bid to end the bloody conflict, which has uprooted an estimated 250,000 people since late August on top of the 800,000 who were already displaced in the region, mainly in North Kivu. “Much remains to be done, but by comparison with where the eastern DRC and the region found themselves on 7 November 2008, I am happy to report some progress,” Secretary-General Ban Ki-moon's Special Envoy to the Great Lakes Region, Olusegun Obasanjo, told the Security Council. He said that DRC and Rwanda have agreed on a military plan to put pressure on the Democratic Forces for the Liberation of Rwanda (FDLR), an armed militia involved in clashes in North Kivu where the national army (FARDC), the CNDP, and other rebel groups such as the Mai Mai have fought in various permutations and shifting alliances. Mr. Obasanjo also pointed to direct talks between the DRC and the CNDP as another advance in the move towards a cessation of hostilities, especially after the rebel group had accused the FARDC in November of incursions into areas it had vacated and asked the UN peacekeeping mission in the DRC (MONUC) to occupy. “The atmosphere between the two delegations has tended to ease, with some confidence beginning to be built and the parties increasingly working together directly,” said Mr. Obasanjo, adding that although Goma – the capital of North Kivu – faces a dire humanitarian crisis, the threat from a military takeover by the CNDP has receded. The two sides also settled on a document establishing the ground rules for substantive discussions, slated to start later this month, and stating the desired outcome of the dialogue should incorporate the January 2008 Goma agreement, which included a commitment by rebels to withdraw their troops and to either disarm or join the brassage process, whereby ex-combatants from armed groups are retrained to form part of FARDC. 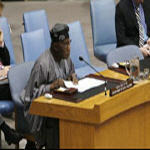 “The momentum for peace generated so far, cannot, must not and will not be allowed to die,” said Mr. Obasanjo. Meanwhile in Nairobi the third session of the peace talks was adjourned until 25 January by the Co-Mediator and African Union Special Envoy, Benjamin Mkapa. “I am very pleased to note that we have made remarkable progress by adopting the ground rules that will guide the noble task of substantive dialogue to resolve the crisis,” he added.